Videographer Chris getting a good angle! The Lachine crew seemed impressed by our well-equipped kitchen. "What do you like to cook on the boat?" Chris asked. Well, on hot nights (like this one was forecast to be) we try not to cook! TIP: A useful item to shoehorn into your tiny boat freezer is pre-cooked frozen shrimp. Later that day, after we'd made it safely out of Montreal, we set anchor in a peaceful bay, just at sunset. I rifled the fridge for goodies from the Atwater Market. Shrimp salad on bibb lettuce with avocado, sweet onion, and red pepper, with a lemon mayonnaise dressing. Accompanied by three-pepper goat cheese on a whole-grain baguette. And don't forget the beer so you can toast: "High Five! We didn't sink the boat today!" It was a particularly fervent toast that evening. 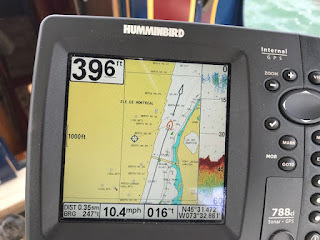 We had survived the passage from the safety of the Lachine Canal into the Saint Lawrence River, which I had fully expected to be the scariest part of the trip. This river is Big. Powerful. 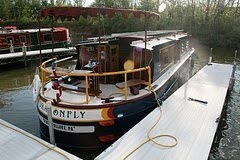 Not the usual cruising ground of peaceful solar canal boats. Leaving Montreal you could SEE the demarcation between the protected water in the harbor and the muscular current farther out. We nosed out and . 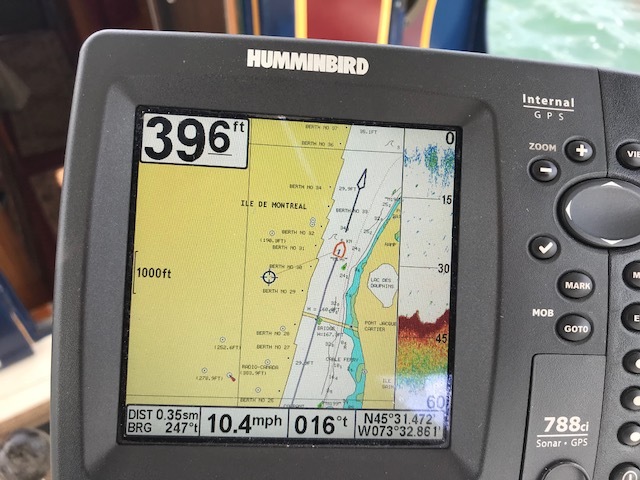 . .
. . .check our chart plotter (boat GPS) at left. Notice the speed . . . a blistering 10.4 mph. Wheeeeeee! All in all, SlowBoat handled it like a champ, except for. . .
. . . the wakes from powerful cruisers that passed us too close and too fast, throwing up big wakes that rolled us side to side. Shake your phone or laptop up and down as you look at this picture to get the full effect. And this was just a little one! Help Us Name the @#$!!@)#%!! I'm trying to come up with a name for boaters who show this lack of courtesy. Moorons? Speediots? Your thoughts? I have a few, but they are not nice. I do prefer to believe they are stupid, not mean. You are right, I'm sure. Some people smile brightly and wave; they have no clue of the chaos they will leave behind them. Other people are looking straight ahead; they don't even really see us. Wakebots? Cruisergoons? Maybe Cap can rig up a death ray laser blaster that would knock out their engines? I saw him delving in the bilges for his potato gun. We're also considering a trained gull that would poop strategicially. Oh I could totally get behind a trained gull or two! In our biz we call them "Sea Gull Missions!". The Sr. Exec VP of Screwing It All Up flies in, lands noisily, poops on everything, then flies off.